Picking the right battle rope can be challenging, especially if you’ve not used them extensively or bought your own before. There are so many different brands, materials, and dimensions – it can be a bit much. In today’s post, we’re going in-depth to discuss the best battle ropes for you and your needs. 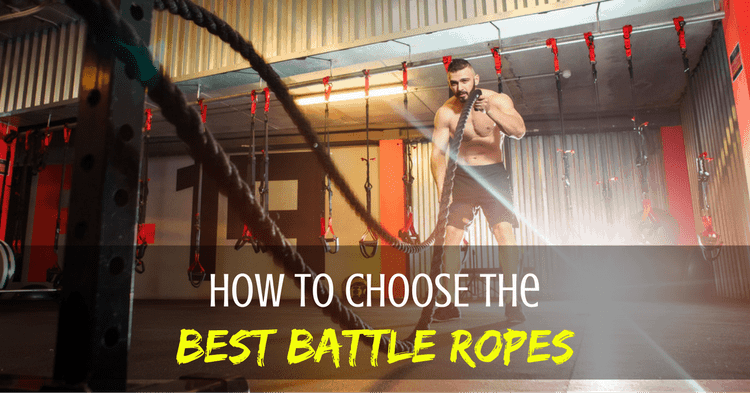 Additionally, we reviewed 10 of the best – and worst – battle ropes you can buy in 2019 so that you don’t have to dig through 100s of product listings! You can check out our findings down below. What Size Battle Rope Should I Get? How much do battle ropes weigh? With this battle rope, you get to choose from a wide variety of sizes with 1.5” thickens and multiple lengths (between 30 and 50 feet), so there will be something to fit your space and needs. The rope itself is made out of Poly-Dacron which is covered with a nylon sleeve that runs through the entire length of the rope. This is a great feature: it will keep your floor clean since any fraying will of the Poly-Dacron will stay inside the sleeve. It will also prevent any dirt from getting inside the 3-strand twisted design – a big bonus since it can be used on any surface without problems. The heat shrink handles are 7.5 inches long, so you also have plenty of grip options. This battle rope also comes with an anchor you can attach it to: no need to spend extra money on fixings. It is priced a little bit higher than the competition, but it’s one of the best in its category for function and usability. This product is a great example of how attention to detail can make the difference between a bad battle rope and a great battle rope. The opinions of existing owners are the best place to start to understand this: customers are very happy across the board, pointing out the durability, usability, and generally how it does the things that you want a battle rope to do. The product is reliable, it has options for bundling with a full hook-and-sleeve anchor kit, a protective cover, and it is incredibly durable. It also has a pretty cool black and yellow design, industry-standard grips and a manufacturer-reputation for good quality and service. This is an example of a battle rope that gets all the basics right, and we’re huge fans of that alone. 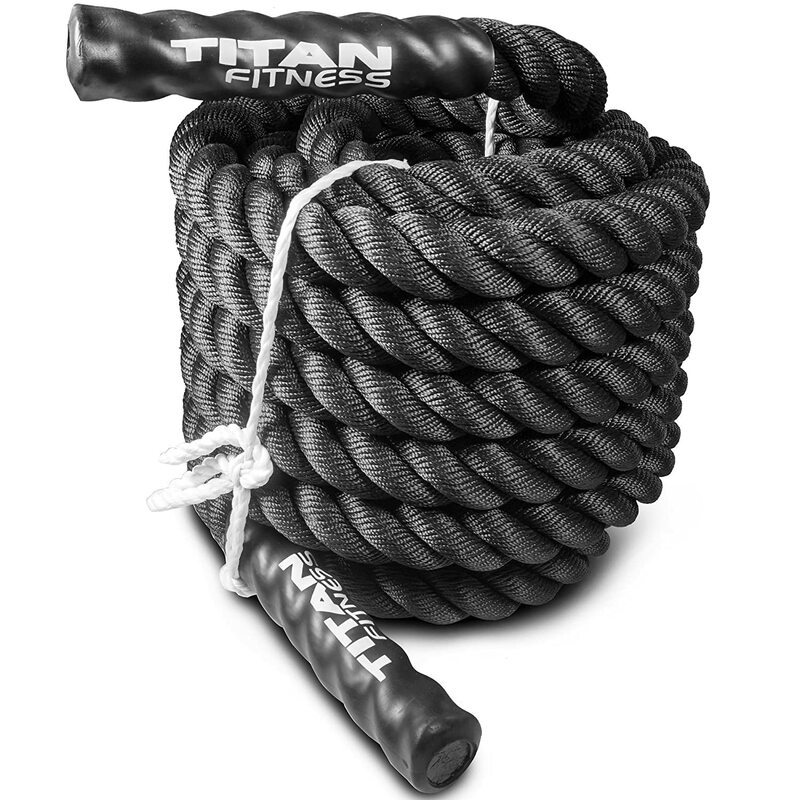 The Titan Fitness battle rope comes in pretty much all the sizes you will ever need, but ever so slightly less than the previous entry. If you have less space in your home gym you might want to go with the 30’. The handles are great, allowing you to get a solid grip on this battle rope despite the slick synthetic rope. 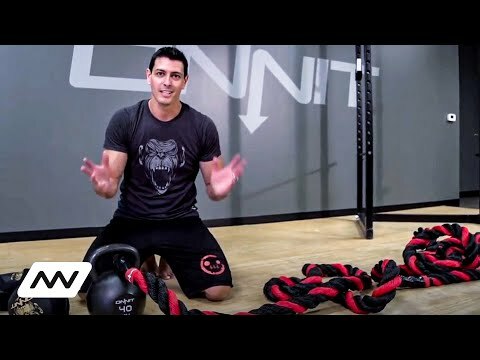 The texture of the handles feel just right: it’s not slippery, even if you get sweaty hands, which is a pretty realistic problem if you’re using battle ropes for HIIT. The Poly-Dacron doesn’t fray out easily. If you really slam it there will definitely be some bits and pieces left on the floor but that’s part of how a rope works at the best of times. All in all, this is a sturdy, heavy-duty battle rope and shouldn’t need replacing for a long time. We would’ve liked to see it coming with a bag or strap for transport but, unfortunately, that’s not included. 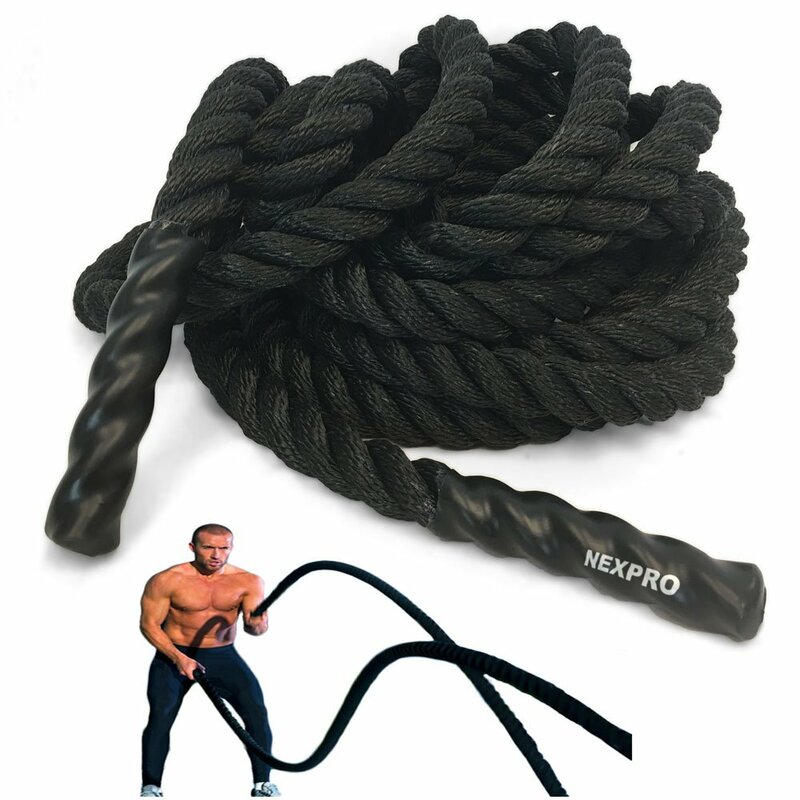 The NexPro is a lighter battle rope as it comes in just 1.5” x 30’/40’/50’. The length is comparable to other models but it’s going to be lighter and less durable than 2” models – making this a niche product compared to other brands. On top of that, there’s no cover to keep it all together. You’re likely to get bits and pieces of it on the floor which can be high-maintenance or simply unacceptable. If you can, use it on softer surfaces such as mats or gym flooring, as this will reduce fraying and abrasion to the rope itself. One thing we liked is that it comes will a small sleeve at the anchor point. That will reduce the friction and boost longevity, since you’re not shredding the rope during a workout. Speaking of the anchor, you will need to buy one separately as it is not included in the package. This seems ridiculous as you’re going to need to attach the rope to something – an anchor really is a big bonus for any battle rope. This is another rope that comes in a full variety of sizes: 1.5-2” thickness options and each comes in lengths of 30, 40, or 50 feet. The package also includes the anchor which is actually just a strap with a hook. This is pretty versatile, but it will still need to be attached to a heavy, immovable object for stability during a workout. Additionally, the handles are not very well stitched to the rope, so they might come off over time, making for a disappointing feature overall. This is part of the larger problem of a tendency to fray and unravel within the first month or two of use – a real problem for a product that is designed to be slammed into the floor. Customers complain of low build quality and unraveling of the rope in a short space of time, which often leads to poor appearance and issues with the handles. This could be a larger problem, with durability being one of the central characteristics for whether a battle rope is great or just average. One particular thing that we liked about the Garage Fit battle rope is the design. It comes in a variety of different colours which look really cool when you’re using it, but it’s hard to say if this is going to be a good selling point when compared with the functional problems. Next, we have the Zeny battle rope which comes in the standard sizing and thickness options. The Poly-Dacron material will fray a little bit faster than you would want it to, even compared to others on this list. This is less of a problem if you can use a home gym flooring surface that is not concrete. 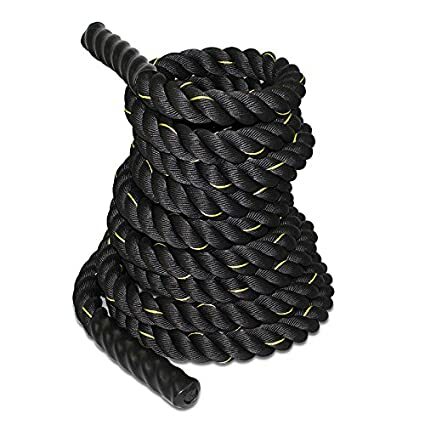 Several users reported this battle rope to be a bit stiff, so maybe go with the 1.5” instead of the 2” if you want to avoid that problem. 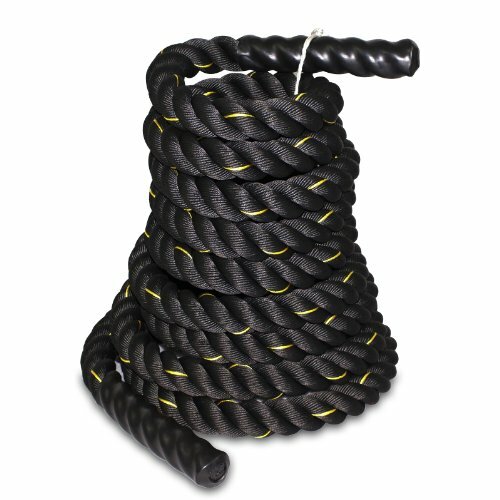 Alternatively, if you’re looking for a heavy-duty rope then you need to be ready to break the rope in over time. 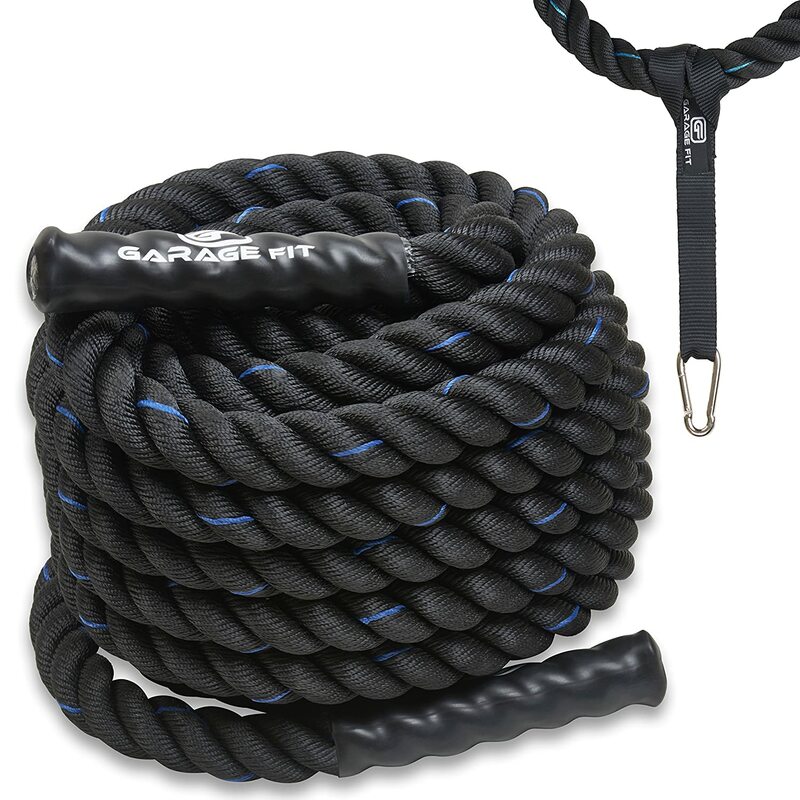 As with the previous product, you can get this battle rope with a protective sleeve option, but you will need to buy an anchor separately. All in all, if you use it on softer surfaces you should be fine with the Zeny battle rope and its high-quality grip construction and materials. Another standard rope sizing, with the standard problems of fraying and grip quality. 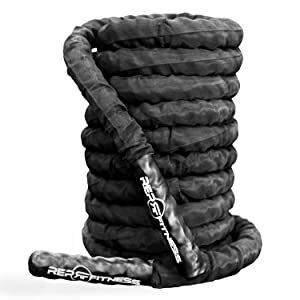 Unlike some other products, this is not insulated at the anchor point so fraying is a real problem if you’re moving sideways during a workout. There are complaints about the quality of this product – while fraying is a common problem, this rope responds badly to being slammed. This is obviously a concern since this is part of the intended purpose of the product. The problems here aren’t just fraying, however. The rope itself begins to unravel as it is not well-secured or woven. 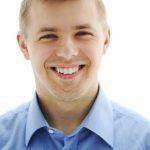 This is a problem – especially when there are many alternatives on the market. This is another rope that bears a striking resemblance to the Power Guidance rope – both in terms of design features and the overall approach to manufacturing. With a similar hook-fastening mechanism you’re going to need to find a way to attach this to a secure object in your gym. This is fine for squat racks and plate stands, but it does seem a little untidy and the risk of breaking is higher than a metal ring-anchor. With additional protection sleeves and anchor-support, however, this product starts to combat the problems seen with fraying and excessive shedding. This means less damage during a training session, so you can focus on the hard work. This product is well-regarded by customers, the features are well-implemented, and we’re big fans of it overall. This covers two products – the regular premium rope and the protective cover, which provides a sleeve that goes around the rope to ensure that storage is not a problem and that the rope sustains the minimum possible damage. The only problems that we’ve got with this rope are that the customer service and quality assurance are spotty, to say the least. Customers complain that, despite being sold as including a hook and sleeve anchor kit, the product is often shipped without it. The designs are cool, the durability is pretty good, and the overall build of the product is impressive. We’d like to see improved texturing of the grips as they can be a little slippery, but no more than others that have been mentioned on this list. 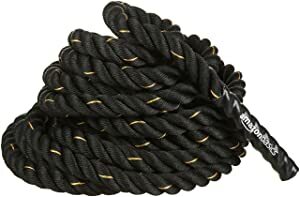 Amazon’s own attempt at producing a battle rope is sadly reminiscent of other low-quality battle ropes we’ve discussed in this list. It struggles with the same duel-problems of fraying and unraveling discussed above. There are problems with the manufacturer’s methods and the companies that re-brand them as their own don’t seem to be providing quality assurance on many of these products. This is combined with a few simple oversights that you might consider to be “basics”: the product doesn’t come with a protective sleeve or any form of anchor kit. This means simply putting the rope around a stable fixing or paying more to get an anchor as well. 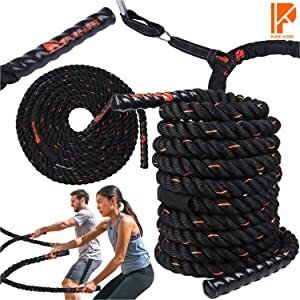 These are industry standard and between the failure to provide basic equipment and the unreliable/poor-durability construction of Amazon’s attempt at battle ropes, we recommend going somewhere else. Amazon’s own battle rope comes with a one-year warranty, but a good battle rope will last more than a year and the need to replace the amazon rope within a year means time and effort you could save by just getting a better-quality battle rope. There are definitely plenty of options to choose from. At the end of the day, it’s a matter of personal preference and personal needs. But if you still can’t make out your mind, here’s a hint. 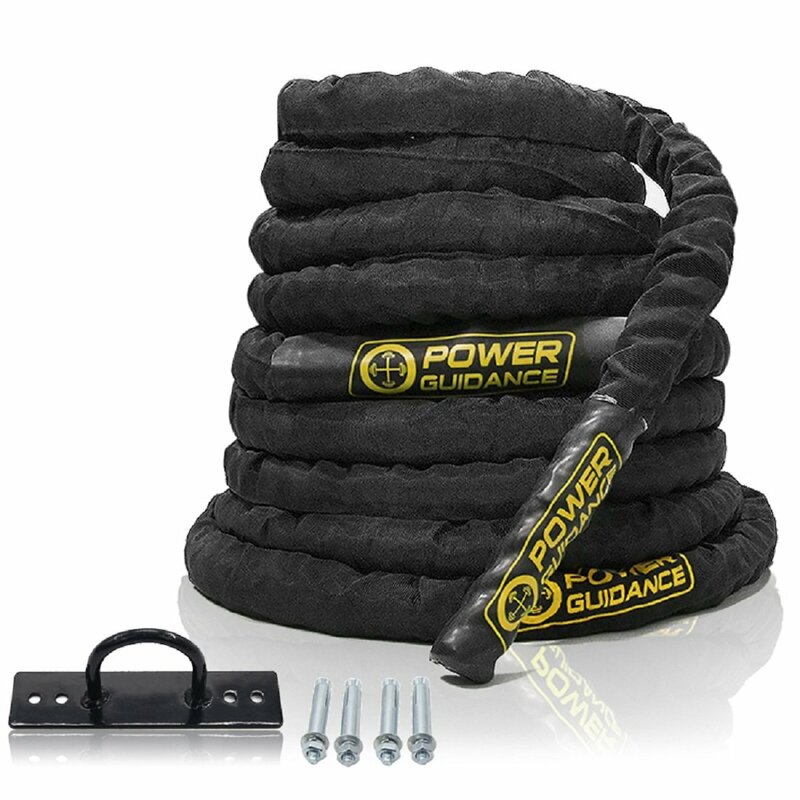 The Power Guidance Battle Rope will probably be the best pick because of the nylon cover which runs throughout the entire length of the rope. So, zero fraying issues here. Additionally, you get a solid wall mount anchor included in the package. Our second top-pick is the RepFitness rope which has fantastic durability, great reputation and has a constant focus on functional basics. This is a great example of a solid, reliable rope that does everything you need it to with no fuss. It’d be our #1 pick if it had a wall-mount, but otherwise a great product. With both of these products you have all the sizing options you will need so you can pick the right length and the right workout intensity for you. Battle ropes are a great addition to any gym – home or commercial. They are awesome for getting your heart rate up and breaking a sweat while on a time limit. 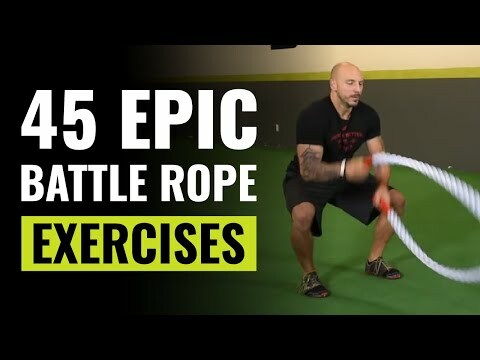 Using the battle rope alone makes for a fast, effective cardio workout while it can also be used as part of a HIIT or circuit training approach with ease. It also provides a great way of incorporating the upper body into endurance training, which is often dominated by the lower body (in exercises like running, cycling, and rowing). Athletes in pretty much any endurance or mixed-demand sport can use them to spice up their workouts and build their endurance. Here are the top characteristics you want to consider before buying your battle ropes. If you will be using these indoors you want to make sure you have enough space. So you’ll need a room which is at least 20 feet long to fit the smallest rope which is 30 feet long. Divided by 2 you get 15 feet of rope and on top of that, you will probably need at least 5 more feet to move around. So if you don’t have at least 20 feet from one side of your room to the other, you can’t really use any battle rope. Depending on what your goals are and how advanced you are, you should use the right battle rope for you. 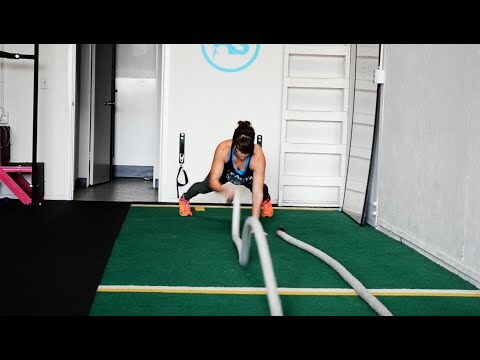 For example, if you are looking to use a battle rope for a cardio session, you should pick a rope which is lighter and allows you to focus on pushing yourself for longer. So maybe go with a 1.5” x 30‘ – a lighter rope that you can use while fatigued or as part of a larger workout. On the other hand, if you are looking to develop your shoulder muscles, for example, you will be better off with a rope which puts more stress on the muscles with each rep. A long, 2” rope which is heavier will develop strength-endurance more effectively: you will do fewer, but harder, reps.
30′ ropes are great for beginners or home gyms, while 50′ is the most common length for Crossfit gym. 2” ropes are approximately 35% heavier than 1.5” ropes. You want to pick a weight which is challenging at first, so you have room to grow and improve your performance. Otherwise, you will end up with a rope which is too easy for you to use after just a couple of months. Obviously, you will need something stable enough to attach the rope to. Some of the battle ropes have an anchor included in the package, but most don’t. So if you don’t have something heavy enough to use, go with a rope which comes with a wall mounted anchor or buy one separately. Almost all battle ropes are made out of Poly Dacron which is a pretty tough material, but eventually, your rope will start to fray over time. All depending on how well it is built and how much you abuse it. Some battle ropes come with a nylon cover which will prevent any faying, so definitely try to get one of those. Especially if you will be using it on a hard surface such as concrete which will damage the rope more. If you can’t get a rope which is covered in nylon, at least get one which comes with a 600D Oxford sleeve to protect the anchor point. That’s the most vulnerable part. And try to use in on a smoother surface. Lastly but not least you want to take a look at the handles. These should be long enough and have a texture which allows you to get a good grip – heat-shrunken caps reduce the risk of any looseness and provide greater durability.